I'm quite elated to finally see this piece of work from an artist I've watched for years. And when the chance finally came up, I jumped on it. This is a 14 x 11 inch ink work on bristol that I'll be receiving through the mail, along with a little badge, from Baka Sukonku of FA. And I know the image isn't all that great because the poor guy doesn't have a scanner. Hopefully when I receive it in person I can take a better image to repost. Artwork is by Baka Sukonku of FA. It is an awesomely epic picture, it is cool to get work from someone you watched and loved. 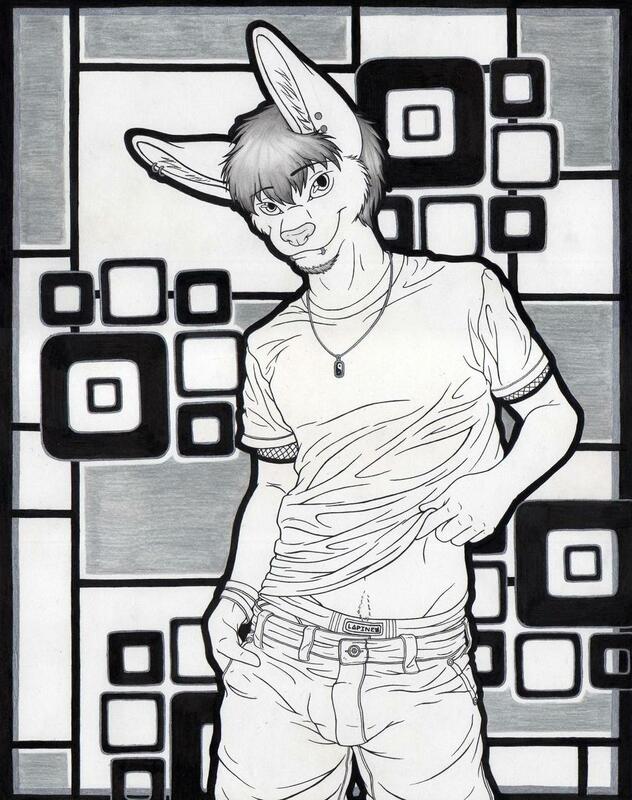 I got a gift picture from a friend from Maxblackrabbit I love it. I have, yeah. But, you have such a silly rabbit fetish, hehe. Is the physical image going to be preserved in some manner? Looks like it's in an nice frame in that picture. Yes, it does look like it's framed, and it's going right up on my wall where it belongs!